What an exciting week on board the Buffalo! We read in Bingham Hutchinson’s diary on Thursday 28th July that three weddings took place on the same day. The ceremony was conducted by Mr W. Howard and was witnessed by the entire crew and all the passengers. Hutchinson’s diary entry gives us few details about the service, including the drinking of ‘wine on the quarter–deck, after which followed singing & dancing.’ With some understanding of English weddings in 1836, we can make assumptions about what other events may have occurred. For example, “To have and to hold from this day forward, for better for worse, for richer for poorer, in sickness and in health, to love and to cherish, till death us do part”, are common marriage vows that have been recited at many English church weddings since 1552. This week we will build upon our own understandings and experiences to explore the concepts of marriage and weddings, from traditional English weddings in 1836, to the weddings from different cultures, ethnic groups, religion and countries in present times. Find information about traditional English church weddings in 1836. How are they the same / different to church weddings today? Hutchinson’s diary entry gives us some information about the wedding celebrations onboard. Use your knowledge of English weddings in 1836 and draw conclusions about what the passengers might have done to mark this significant occasion. Why have some wedding traditions changed over time and others have remained the same? In the mid 19th century, English women outnumbered men by 360,000 (9.14million and 8.78million) with 30% of women over 20 unmarried. How did society view and treat unmarried women during this time? The wedding industry is very big today, with weddings varying in size and cost. What needs to be considered when planning a wedding today? What was Hutchinson referring to in his passage, 'The first number of the ‘Buffalo Telegraph’ appeared? What changes were made when the English parliament introduced the Marriage Act of 1836? Have you heard the rhyme, “Something old, something new, something borrowed something blue and a silver sixpence in her shoe?” It originated in Victorian times. Find out what is meant by this rhyme and why is it still recited today. 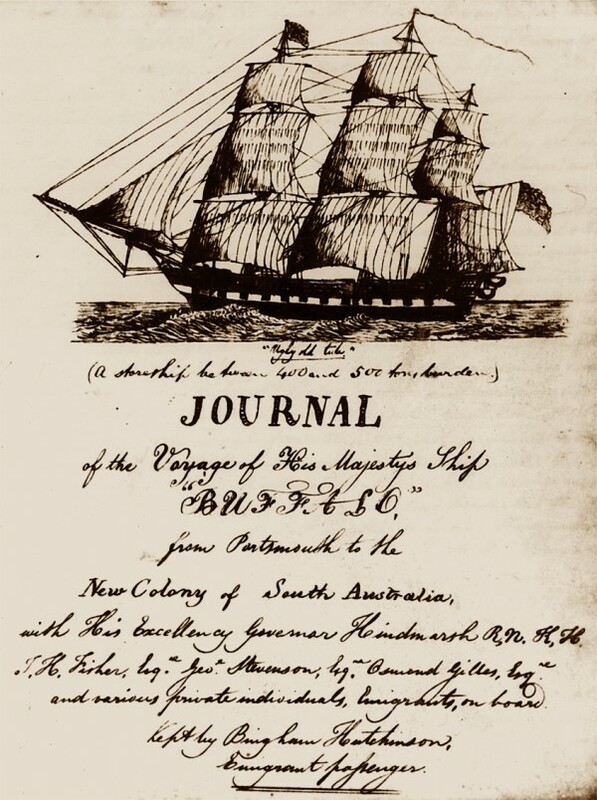 Hutchinson’s journal states that “prayers to be used at sea, were offered up by the Revd C.B. Howard.” What conclusions can we draw about the wedding from this information? Some universities offer a Bachelor of Photography degree. What skills does a good wedding photographer need? Brainstorm these as a group and develop a list on the whiteboard. Invite class members to place sticky notes next to each skill, giving examples of how these skills can be applied in different situations. In 1840, Queen Victoria and Prince Albert were married on 10th February 1840 at the Chapel Royal in England. The official website of the British monarchy gives us an insight into this wedding. Recently, Prince William (the Duke of Cambridge) and Catherine Middleton married on 29 April 2011 at Westminster Abbey in London. This was a lavish royal wedding watched by many people across the globe. Find out as much as you can about these two royal weddings and make comparisons between the ceremonies. How much interest was generated by each of these weddings and how has technology enabled more people around the globe to view and feel as part of this significant commonwealth event? 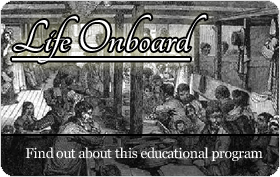 Last week we explored the concept of superstitions at sea. Did you know there are many superstitions associated with weddings? Many believe that it is bad luck for the groom to see the bride on their wedding day before meeting at the alter. What are some other superstitions associated with weddings? A wedding reception is controlled by an MC who coordinates the event. Many speeches are given at weddings, including a speech by the bride’s father, groom, best man and anyone else who has something to say. Develop a speech that you could give about someone important in your life. Be sure to include the significant contributions this person has made and how these have affected you. Imagine you are one of the brides or grooms onboard the Buffalo. Give careful consideration as to what events might have taken place on this ‘special day.’ Write a letter to your family back in England, giving details about the day and your feelings. Look at the structure and content of invitations from a variety of special events. Identify a special event that is coming up, a birthday, wedding, school open night, christening, class party, or parent / teacher interview. Use at least two pieces of technology to design and create an invitation to your event. What do you consider to be the ‘essential elements’ required for a good wedding? Remember, a wedding can quickly become an expensive event. Identify the expenses involved in planning either a wedding, or an event you are holding. Use a variety of resources to cost your chosen event. Total the price of your event and make comparisons with others as to how much money you would need to hold the event. Can you reduce costs by eliminating some of the elements? Cameras were in their infancy in 1836, and with no photographs taken onboard these vessels, we need to use our understandings to imagine the scenes onboard. Today however, most people own a camera of their own. At weddings, many couples employ professional photographers to take photographs of their special day. Have you heard the saying, “a picture speaks a thousand words?” What is meant by this? Have a look through images on the computer or in magazines to identify photographs that attract your attention. What features make particular photographs stand out from others? Use digital cameras to take photographs in your school environment. Be as creative as you can, remembering the elements of a good photograph. Select your favourite photograph to print and give it a title. Share your photography with others by creating an exhibition. Identify the common elements in most weddings. Work with a partner to research a wedding from a particular culture / religion, aligning your research with the identified elements. Present your findings to the rest of the class. Identify the different perspectives and beliefs by comparing the weddings presented. Have you ever been to a wedding? How do you think it compares to the three held onboard the Buffalo? Ask others in your class to share their wedding experiences, identifying both the good and bad elements. Use your combined understandings and experiences to develop a wedding guide / checklist that could be given to engaged couples to help them plan for their special day. During the 19th century the minimum age for marriage (with parental consent) was 12 for a girl and 14 for a boy. It was not until 1929, that the English Parliament, in the Ages of Marriage Act raised the marriage age to 16 for both sexes. This is still the minimum age today. Do you think teenagers at the age of 16 are old enough to commit to a lifetime of marriage? In 1836, when a woman got married in England, all her money and possessions were given to her husband. Up until the How did the passing of the Married Property Act, 1882, even if a woman worked, her earnings would also belong to her husband. Do you think this was a fair and equitable law? Divorce and separation was virtually unheard of in 1836. What if one of the passengers who married onboard the Buffalo later decided that they were not suited to marriage and wanted to leave their partner? In the past weeks we have learnt about animals seen during the voyage and those that were taken onboard to provide food in the new colony. Did you know that on some ships people kept a pet? Last week we learnt that keeping a cat onboard was considered to be good luck. Next week we will find out which ship had a cat on board and learn about the challenges faced by such an inquisitive animal.